Easton Wesleyan School is a former school of late 19th century origin in Easton, built in 1877-78 and opened in 1878. It served as a council school from 1905 and closed in 1926 when it was replaced by the new Tophill School. The building then became the hall of the adjacent Easton Methodist Church, which it continues to serve as today. The former school, with its boundary wall, has been Grade II Listed since May 1993. Portland's Methodist circuit was established when the preacher Robert Carr Brackenbury visited the island in 1791. He had a small chapel built at Fortuneswell in 1792 and purchased a house at Wakeham in 1794 for use as a chapel to serve Tophill. After his death, his wife paid for a purpose-built chapel to be erected within the hamlet in 1825, which in turn was replaced by one at Easton in 1854. 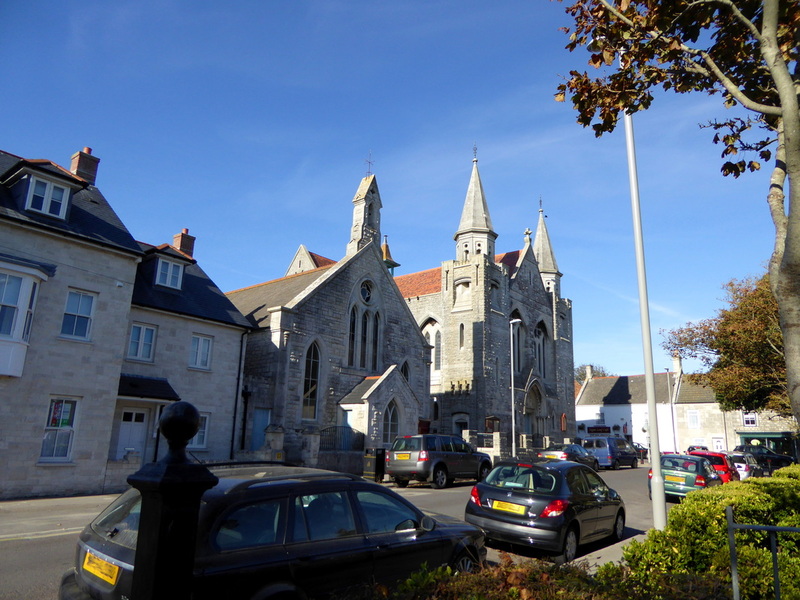 With a Wesleyan Day School having opened at Fortuneswell in 1845, the 1870s saw plans made for a new Wesleyan school to be erected at Easton, which would serve as both a Day and Sunday school. Although an 1874 meeting over the potential school concluded that the existing ones on the island were adequate, the decision was soon made to proceed with the idea. Fundraising for the school's construction began in 1876. One bazaar held at Portland's Drill Hall that September was recorded as being well-attended, with "the result [being] most satisfactory". The chosen site for the school was Easton Square and its construction, which was carried out by Lynham & Bayliss of Portland, commenced in May 1877. The opening ceremony was held on 21 April 1878, with Rev J. Hawkey and Rev W. Fell delivering addresses. As a mixed school, it was able to accommodate 317 boys and girls, with Mr Arthur Ridge serving as the original headmaster until 1884. He was succeeded by Mr W. N. Ager until 1893 and then Mr W. Edwards until 1924. The school was recorded as having an average attendance of 237 children in 1889 and 322 (110 of which were infants) in 1904. In 1903, the Wesleyan trustees announced their decision to close the school, prompting Dorset County Council to make plans to continue running it themselves as a council school. The leasing of the building to them had originally been intended for 1 September 1903, with the proposed terms including the council paying an annual rent of £80, an annual £45 for lighting, heating and cleaning, and around 83.3% of the costs of necessary internal repairs. The Wesleyan trustees would be responsible for the costs of insurance and any damage to the building during the duration of the lease. However, it remained open as a Wesleyan school beyond this time while talks between the two parties continued, with the council establishing a sub-committee to negotiate with the trustees. In September 1904, the Western Chronicle reported that an agreement had been made for the school to be leased to the council for 10-11 years. The lease commenced on 1 January 1905, although it was not finalised until the following month. The same year saw the school extended, most notably westwards with the addition of a rear wing, and these new classrooms allowed it to accommodate up to 339 children. The school continued to teach boys, girls and infants, and was also provided with a "babies' room". In 1911, the school's average attendance was recorded as 219 boys and girls, and 85 infants. By the 1910s, Portland's existing schools were suffering from overcrowding. While a new council school was built and opened in 1913 to serve Underhill, the planning of and discussions for a new Tophill school continued into the following decade. In 1912, the Portland School Attendance Committee had expressed their hopes that a solution to the overcrowding would be found prior to the expiration of the Easton school's lease on 31 December 1915. The new Tophill School was eventually built in 1925-26, resulting in the closure of the Easton Council School. 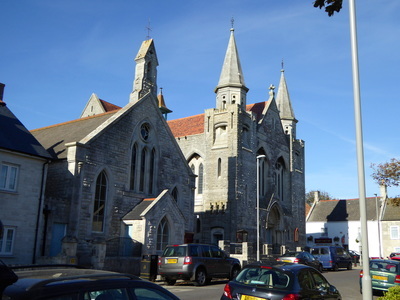 The former school building then became the hall of the adjacent Easton Methodist Church, which had been built in 1906-07 to replace the earlier Easton chapel of 1854. The former school is built of coursed and squared Portland stone, with slate roofs. In its current guise, it has a cruciform shape. The facade has a projecting porch, and features a triple lancet window and bellcote above (the school bell was removed in 1974). Upon its opening, the Southern Times and Dorset County Herald described the school as a "fine building", while the Appraisal of the Conservation Areas of Portland considers it a landmark building within Easton's conservation area. The former Wesleyan school, with the Easton Methodist Church on the right.